"40 Days of Prayer" Books available for free. Request a copy for yourself and ask for more to share with your church! ENCOURAGE every Ohio Christ Follower to daily follow this simple, personal Prayer Pattern to continue building a relationship with Jesus. 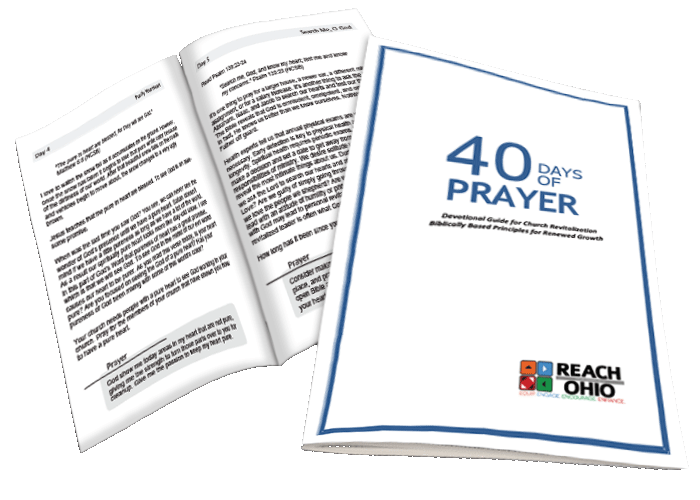 EQUIP individuals, families, age groups, small groups, large groups, churches, or associations with Prayer Resources to deepen relationships with Jesus. 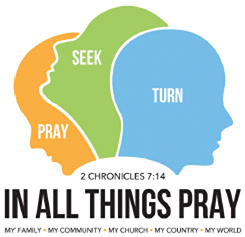 Another great website, In All Things Pray, has several free resources. For additional assistance to schedule prayer training, a retreat, or a conference, please contact Steve Hopkins at 614-601-6820 or SteveHopkins@scbo.org. God usually sends revival on the waves of united, fervent, persistent prayer. The great, known revivals that have left the most indelible marks on past generations grew in the fertile soil of prayer closets and prayer groups and praying churches – often through months and years of cultivation among believers who refused to stop believing that God would hear and respond. That’s why we are championing a united rhythm of prayer, inspired by what was known centuries ago as ‘concerts of prayer.’ These involved willing individuals and groups who would commit to regular cycles of prayer, which would then spread to other places where people were following a similar schedule. God responds to the surrendered, repentant, expectant hearts of His people, and He blesses and moves even more when we’re working together. Prayer is a relationship far more than a ritual or discipline. Prayer is our discovering what God wants us to do and joining Him as co-laborers through our prayers. Through meditating, the act of reflecting on God’s word and quietly listening for His still small voice, you learn to hear God’s leading and thus your prayers initiate from His heart and mind.